Come make a joyful noise with us! The Parish Choir sings at the 10:00 am Mass each Sunday during the school year, as well as Christmas and Holy Week. Rehearsals take place every Wednesday in the choir room from 7:00 pm to 8:30 pm. No auditions are required. 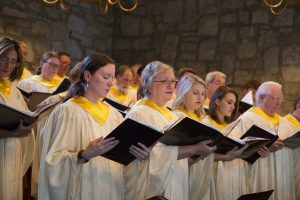 For information about joining the choir please contact Kathy Cahill, Director of Music and Liturgy, at 770-394-3896 X 261.